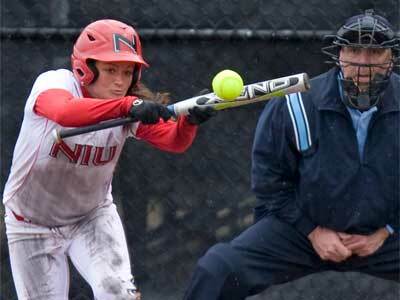 The Northern Illinois University softball team rallied in its last at bat to pull off the come-from-behind 4-2 victory over Central Michigan at Margo Jonker Stadium Sunday afternoon. Trailing 2-1, heading into the top of the seventh, the Huskie (16-20, 4-4) offense erupted with a three-run inning. With one on and one out, senior Dani Parrish (Plainfield, Ind./Plainfield) hit a two-run homer to right field to give NIU a 3-2 lead. Three batters later, with runners at first and second, Jennifer Barnett (Indianapolis, Ind./Roncalli) singled to center to score an insurance run to give the Huskies a 4-2 lead. “It was great to see the seniors step up today,” said NIU head Lindsay Chouinard. “Carly [Norton] led off the top of the seventh inning and ended up getting on base, working the count and getting hit by a pitch. Then Dani hit the two-run homer to put us back in the game. Megan Dortch (Reno, Nev./Bishop Manogue) came in in relief for starter Jessica Sturm (Wichita, Kan./Goddard), who went six innings, allowing two runs on five hits, to pitch bottom of the seventh. Dortch picked up the save, holding Central Michigan (16-16, 3-4) scoreless and securing the victory for Sturm (5-6) and NIU. The Northern Illinois offense tallied nine hits on the day with Parrish leading the way with a perfect 2-for-2 afternoon with two RBIs and a run scored. Amanda Sheppard (Oak Forest, Ill./Oak Forest) was 2-for-3 with a run scored, while Barnett was 1-for-4 with an RBI. NIU’s victory Sunday was the third straight for the Huskies and wrapped up a 3-1 road trip and leveling their conference record to 4-4. 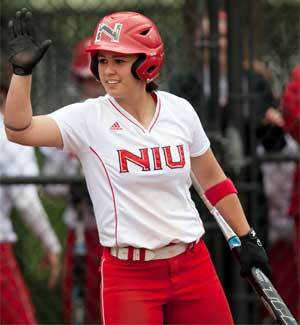 The Huskies return to the diamond Tuesday, April 10, when NIU welcomes DePaul to Mary M. Bell Field. First pitch is set for 4 p.m. Central Time. Fans can follow all the action live via Gametracker at NIUHuskies.com. For more information on NIU softball and Huskie athletics, visit www.niuhuskies.com.